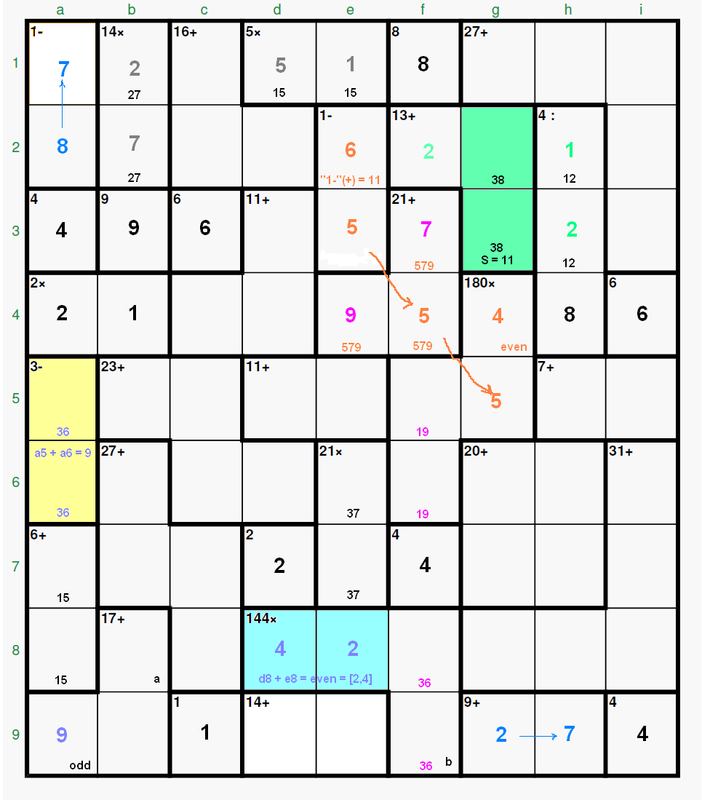 Calcudoku puzzle forum :: View topic - Can anyone show an analytical solution for the 10 March 6x6? Can anyone show an analytical solution for the 10 March 6x6? Post subject: Can anyone show an analytical solution for the 10 March 6x6? 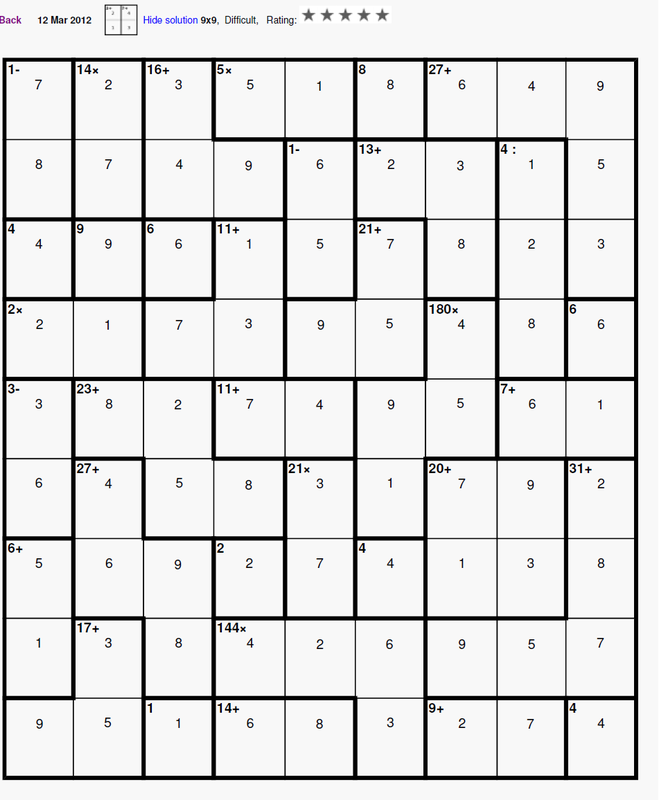 I would be very interested to see an analytical approach to solving yesterday's 6x6 (10 Mar 2012). I've been reading and learning from the many excellant posts in this section. But nothing that I tried seemed to work for me and I eventually had to use brute force to solve it. I will try this "6x6 difficult" (Puzzle id: 430420) (it has a solver rating of only 50 and 218 solvers) (by the way, which country are you from?) (your doubts, if any, welcome, though in about a week I will be travelling for another eight days though I hope anyone would answer). There are different ways to arrive to the solution. In the process I have followed I have used some times the “international terminology” (below the graphics, for instance, but I believe it’s easy to follow) and the conventional language in other places to make the things easier. 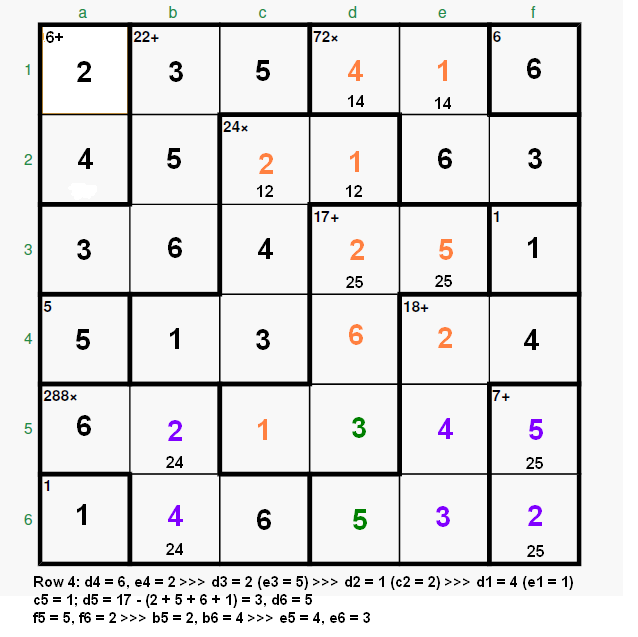 First we write the candidates for the cages “6+” and “7+”; observe that since a 5 can not be either in f2 (it is not a divisor of 72) or in f4 (there is already a 5 in row 4, in a4) it must be “7+” = [2,5]. Row 2: b2 = 5 (the 5 is not a divisor of 24 or 72) so that’s the only valid position for a 5 in row 2 and it follows that c1 = 5 (unique position for a 5 in row 1). Here we arrive to an interesting point. First observe that the blue and yellow areas must have a sum of 13 (since columns 1 and 2 must sum 42 = 2 x 21, that is, two lines). First. Deciding that a 1 is not possible in b1 because we would have left to 22 a sum of 11 (5 + 6, unique) for a3-b3 which is impossible (due to a4 = 5 and b2= 5) so b4 = 1 (unique). 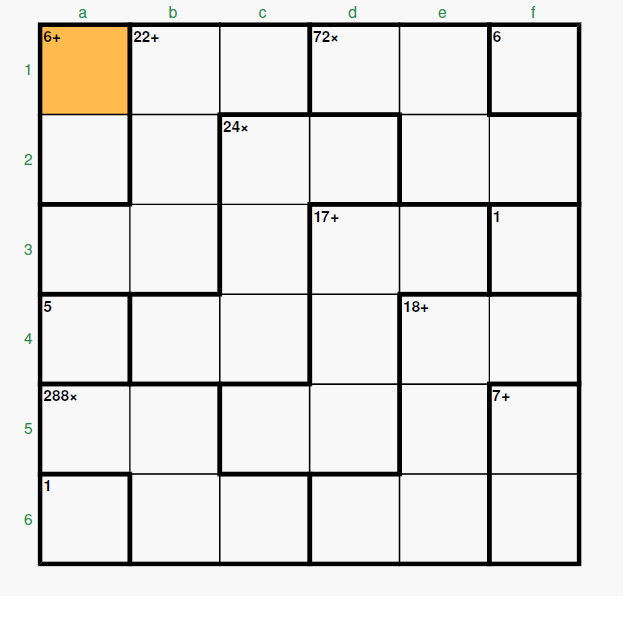 Consequently the yellow area (which sum would be 12) is 2-4-6 (>>> a5 = 6, a3 = 3) (with 3 numbers from 3-4-4-6 you can not obtain 12) and c6 = 6 (the number left) (with b5-b6 = [2,4]) (perhaps someone could say that this process is of the type “guessing”). Second. Deciding “directly” that a 6 cann’t go to a3 because then b1-b3 = [2,4] (unique, to have the sum 22) but since now a5 =3 that situation is in conflict with the rest of the combination, 4-4-6, because we would need the two 4’s in b5 and c6. Consequently a3 = 3, a5 =6 once more (also “guessing”?). b4 = 1 + 2-4-6 (for Y, from the combination 2-4-6-6) as the solution for that part of the puzzle, and then c6 = 6, a5 = 6, a3 = 3, b5-b6 = [2,4]. (Inversely, the minimum for b4 is 1 but, would it be possible b4 = 2? … clearly no because then Y = 11 but 3-4-4 [the only group within those two combinations to produce a sum of 11] is not allowed in the yellow area). Once we know the 3 is outside the cage “288x”, that is, a3 = 3 >>> b1 + b3 = 9 >>> b1 = 3, b3 = 6 (unique). Now (this part shown in blue colour) that we have a 3 in b1, we decide that “72x” (that initially had four possible combinations: 1-2-6-6, 1-3-4-6, 2-2-3-6 and 2-3-3-4) must be [1,3,4,6] because a 1 is required in row 1 but 1-2-6-6 repeats a 6 (or, alternately, if you prefer this way of thinking, because two 2’s or two 3’s or two 6’s are not allowed now inside the cage “72x” permitting only the 1-3-4-6). So e2 = 6, f2 = 3 (f4 = 4), d1-e1 = [1,4] what forces a1 = 2, a2 = 4 and consequently c1-d1 = [1,2]. In the cage “24x”, the product of c3 by c4 must be 12, and being c6 = 6, it follows that c4 = 3 and c3 = 4 thus d3-e3 = [2,5]. The rest is straight forward (in brown colour): In row 4 the 6 goes to d4 >>> e4 = 2 this forces d3 = 2 (and e3 = 5) forcing d2 = 1, c2 =2 and c5 = 1 (additionally d1 = 4, e1 = 1). Inside “17+” we need a 3 in d5 (green) to complete the sum >>> d6 = 5. And the final steps in violet colour. 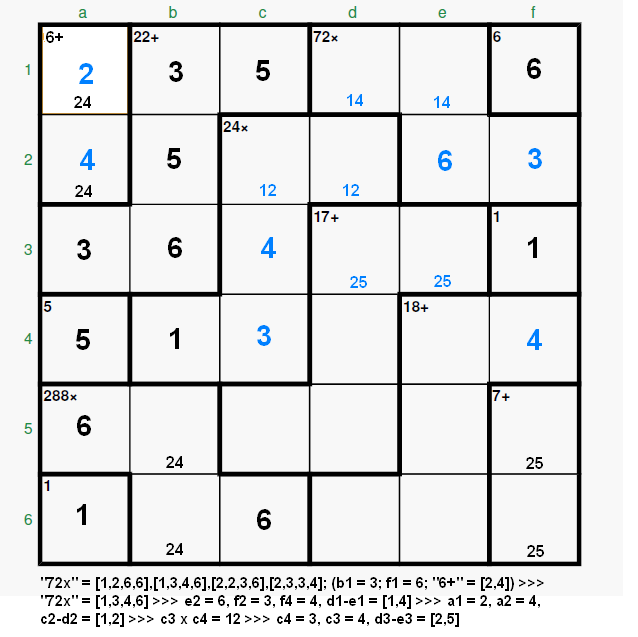 Final comment: As mentioned above, the analysis could have been started in other place, following a different process, i.e., (with the 5’s in b2 and c1) by studying the two possibilities 1-3-4-6 and 2-3-3-4 for the cage “72x” (the other two, 1-2-6-6 and 2-2-3-6, inmediately suppressed because of the repetition of the 2 or the 6), etc.. Thank you clm. Much appreciated. I got the 5's in c1 and b2 sorted out and even managed to discern the 1-3-4-6 for 72x but then couldn't quite see my way forward to solve the rest. FYI, IMHO guessing is throwing in a number in and seeing what happened. Stating a systematic hypothesis and then seeking to disprove it still falls in the analytical camp. So it counts for me! ... FYI, IMHO guessing is throwing in a number in and seeing what happened. Stating a systematic hypothesis and then seeking to disprove it still falls in the analytical camp. So it counts for me! Welcome, and thank you because today I have learned this new expression, IMHO (first time for me, I had to go to Google) (I knew FYI and ASAP, etc. ), in our language we use very very few phrases “compressed” and I like much those acronyms. The new feature, “guessing” numbers in a cell (or writing the candidates), just introduced by Patrick, will help a lot to solve the puzzles on-line. It will make easy the use, in some cases, as additional tools for the calcudokus, of techniques that have its origin in the “sudokus”, like the X-ray (X-Wing), or the XY-Wing, etc..
S = n * (n + 1) / 2, being n the size of the puzzle (n could be any natural number). For puzzles with 0, we just reduce a degree the size of the puzzle as commented in the referenced topic. or, simply, multiplying the value of a line by n (the size of the puzzle). Very curiously, for n = 1, 5, 9, 13, 17, 21, … (when the size = multiple of 4 plus 1) the full puzzle has a sum odd, in all the other cases the puzzle sum will be even (this has an easy algebraic demo) (the sum of the full puzzle can be useful sometimes, specially in the 5x5’s or 6x6’s). First we write the candidates in those cages well defined including the cage “4:” (with the only combination [1,2,8]) where the 8 must go to h4. The cell a9 is odd (parity property for column 1, with a sum of 45, which is odd) consequently it cann’t be an 8 so the 8 of column a, the leftmost column, goes to a2 (unique). from this equation it follows that b = a, that is, f9 = b8. Now a 2 can not be placed in a9 or b9 (2’s already present in both columns) nor inside “14+” nor in f9 (because the value of b8 would also be 2 and that’s impossible) so, since there is already a 2 in column h, g9 = 2 (and thus h9 = 7). Now we go back to column a: the 7 must go to a1 (a9 now forbidden) (we can define now the numbers in cage “14x” though we can do it later). For the next step we look at the “isolated” cell g4: The sum of rows 1 thru 4 is 180 (= 4 x 45), even, so applying the “parity property” (very easy in this case since there are no uncertainties in the “addition value” of the cages) we find that g4 must be even, and its value must be 4, the only even number left (2, 6, and 8 already in row 4). Next: We calculate the sum of cells of the cage “1-“ (knowing that four rows have a sum of 180) and we find a value of 11 so e2 = 6 and e3 = 5. The cage “21+” would initially have these possibilities: [3,9,9], [4,8,9], [5,7,9], [5,8,8], [6,6,9] and [6,7,8] but, since the 8’s are not allowed and, in this case, the double 6 or double 9 is not permitted, the only valid combination left is the [5,7,9] so (see the orange arrows) the 5 goes to f4 and the 5 (required) inside the cage “180x” must go to g5 (and necessarily f5-f6 = [1,9]). Again we use the property of the addition applied to the three rightmost columns (a total of 135 = 3 x 45) so the green area must sum 11 and consequently f2 = 2. We complete the candidates for f8-f9 = [3,6]. 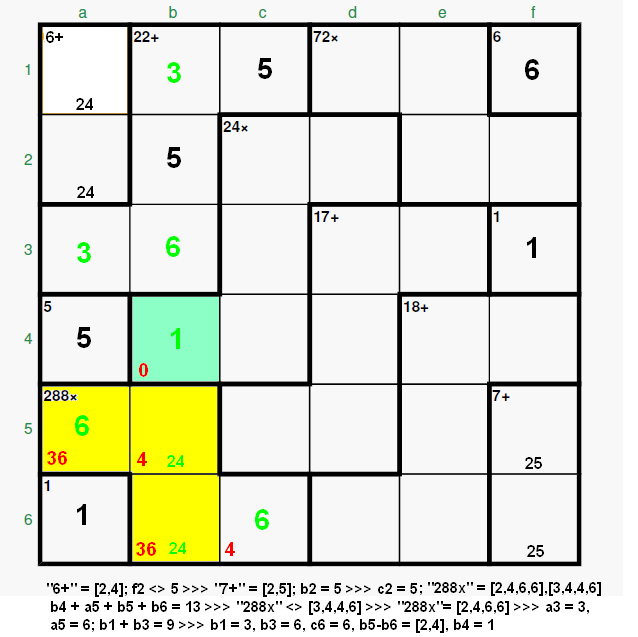 From this point we may set, for instance, the final values in cages “14x”, “5x” and “4:” (green and gray), quickly observing as well that g2-g3 = [3,8]. Even more: In the cage “144x”, the product of d8 x e8 must be = 144 / 18 = 8 so d8-e8 = [1,8], [2,4]. Using again the parity property for the five bottom rows (a total of 225 = 5 x 45, odd) we derive that the blue area (d8-e8) must have an even sum so it must be [2,4] >>> e8 = 2, d8 = 4 and, since we have all sums of the cages in those five rows, we deduce that “3-“(+) = 9 (yellow area), then “3-“ = [3,6] and consequently a9 = 9. We have seen how we have obtained a lot of information using only analytical tools, like the parity rule or the property of the addition.